THE STANDARD ST36 IN BLACK CHROME FINISH AND THE EVER POPULAR ST 36 IN RED ARE BY STANDARD SET UP FOR DEAD AND LIVEBAIT FISHERMAN. THE BARBS CAN EASILY BE CRUSHED BY PLIERS FOR PEOPLE WHO WANT THE UN-EASE OF UN HOOKING. 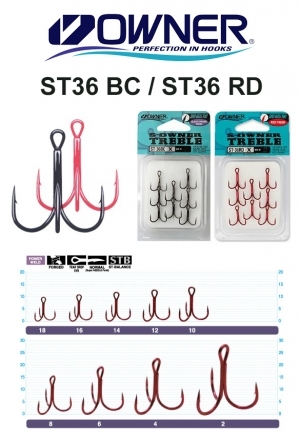 Available in both corrosion-resistant black chrome finish and red, these are ideal for deadbaiting or livebaiting, either as replacement hooks for smaller profile lures or as a “stinger” when bait fishing. Features include round bends, plus three straight Super Needle Points for wide-gap hooking efficiency.